Mark Hulbert writes in the The Wall Street Journal that all eight of the most historically accurate long-term (10-year) valuation metrics he's found for the S&P 500^a are running hot, implying that S&P 500 returns are "likely to be well below historical norms" over the coming decade. The range of expected annual real (i.e. after inflation) returns given by the eight valuation metrics is currently -3.9% to +3.6%. For some perspective, the S&P 500's average annual real return over the last 200 years is north of +6.6%. As fundamental, long-term, valuation-sensitive investors, we are well acquainted with these eight metrics, and agree with Hulbert's message that investors putting money into the S&P 500 today should expect modest, if not severely disappointing, 10-year returns. Fortunately we have a go anywhere, active mandate from our clients, which allows us to underweight the US market in favor of more attractive investments overseas. • The Q ratio [...], which is calculated by dividing market value by the replacement cost of assets—was the outgrowth of research conducted by the late James Tobin, the 1981 Nobel laureate in economics. • The price/sales ratio [...] is calculated by dividing the S&P 500’s price by total per-share sales of its 500 component companies. 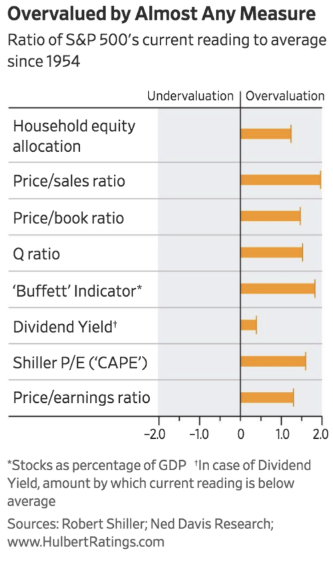 The CAPE is similar to the traditional P/E except the denominator is based on 10-year average inflation-adjusted earnings instead of focusing on trailing one-year earnings. • Dividend yield, the percentage that dividends represent of the S&P 500 index [...]. • Traditional price/earnings ratio [...]. • Price/book ratio—calculated by dividing the S&P 500’s price by total per-share book value of its 500 component companies [...]. Hulbert does present a rebuttal to the bearish signals coming from these eight valuation metrics from Jeremy Siegel, a professor at Wharton and author of Stocks for the Long Run. Siegel points to several issues that may make these metrics less useful than they have been historically — basically that "it's different this time." However, Siegel doesn't point to any valuation metrics that forecast average, let alone above-average, long-term returns for the S&P 500. But this isn't surprising from Siegel as he is a storng proponent of a buy and hold strategy, regardless of market valuations. For Siegel, it's always a good time to be fully exposed to the US equity market. We think that the typical individual investor can improve his or her returns by following Siegel's buy and hold advice as it eliminates the average investor's tendency to buy high and sell low. Dalbar, a financial research firm which tracks individual investor behaviour, found that the average investor in US equity funds underperformed the S&P 500 by 3.62 percentages points per year over the last 10 years ending December 31, 2017. Some of this underperformance can be chalked up to fund management fees, and trading costs and spreads, but by far the majority is the result of bad investor timing. Returning back to the valuation metric that Hulbert found to be most reliable in predicting future long-term returns, household equity allocation (what percentage of household financial assets are allocated to equities), investors tend to be overweight equities at the wrong time, and also underweight at the wrong time. Said another way, they buy high and sell low. And another: Bad investor timing. In our humble opinion, we think we can do better than both the average investor and the buy and hold investor over the long term (e.g. through an investment cycle) by using long-term valuation metrics and long holding periods. ^Indices are unmanaged and investors cannot invest directly in an index. The performance of indices do not account for any fees, commissions or other expenses that would be incurred. aThe Standard & Poor's 500 (S&P 500) Index is a free float-adjusted market capitalization weighted index that is designed to measure large cap US equities. The index includes 500 leading companies and captures approximately 80% coverage of available market capitalization in the US equity markets. Copyright © 2018 AlphaGlider LLC. All Rights Reserved.